An integral part of ancient life, animals were keenly observed by the Egyptians. And cats figured prominently among them, whether seen in the world of nature or in the home. Lions and panthers were encountered in the wild, while smaller cats—first domesticated in Egypt—were frequently kept as pets. The Egyptians did not worship felines. They did, however, associate cats’ natural traits with the characteristics of specific divinities. 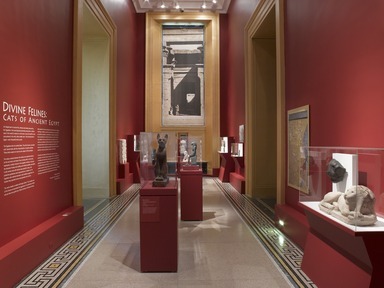 These divine aspects of cats are the subject of this exhibition. 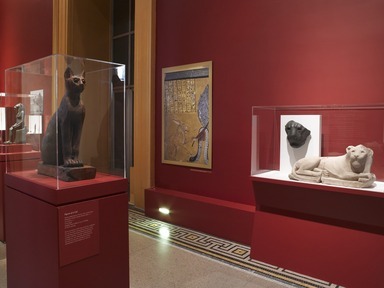 The sharp contrast between the female cat’s maternal instincts, on the one hand, and felines’ fierce hunting skills, on the other, represents a duality inherent in the Egyptian worldview. Because the domestic female cat’s fertility and motherly qualities associated it with women and with divinity, many peaceful, caring, and protective goddesses were represented as a female cat. Yet Egyptians also admired domestic cats’ predatory aggression: as hunters they guarded homes and granaries from vermin. The same duality is evident with larger felines. The complex role of the lioness incorporated the aggression of a protective mother and yet also her gentle love. Myths involving a ferocious lioness raging against enemies and defending her family abound in Egyptian mythology. In addition, powerful and majestic lions were venerated as symbols of pharaoh or manifestations of gods: connected with the sun by their love of warmth and their red or yellow fur, felines were related to the sun god Re himself, who appeared in some myths as a combative cat. Feline strength and the danger it posed to humans linked cats with the corresponding qualities of the desert sun. Lioness goddesses guarded Re, and male lions evoked protection, acting as guardians at palaces and temples. 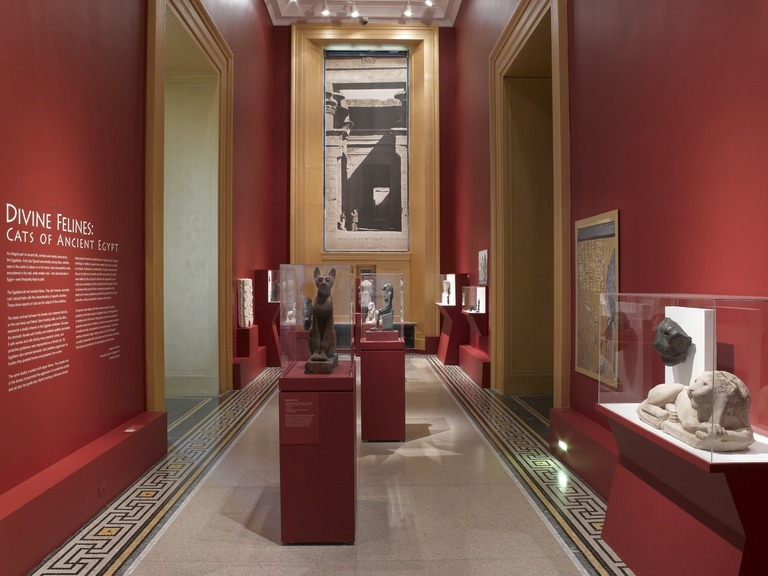 Composite male deities with feline features gained increasing popularity in the later periods of Egyptian history. Worshipped both in temples and in the home, these gods were seen as guardians of pregnant women and of children, as well as more general custodians of health and fate, and protectors of important places. The sphinx—another composite image, dating as early as the Old Kingdom—is usually represented with a lion’s body and human head, symbolizing both power and protection, the dual aspects of divine felines. Many powerful goddesses—including Mut, Sakhmet, Bastet, Tefnut, Shesemtet, Pakhet, Mafdet, Wadjet, and others—were represented as a lioness or lion-headed woman. Perhaps aspects of the same goddess, these feline divinities had individual characteristics. Nevertheless, each was known as the daughter of the sun god Re and the “Eye of the Sun.” The sun god’s might and his wrath manifested as the fierce lioness. She protected him and helped defeat his enemies. The duality of feline aggression and caring protection was reflected in myths that told of a divine, raging lioness leaving her community and returning as a pacified cat. In one such myth, Re sent his daughter Sakhmet, in lion form, to destroy rebellious mankind. But when he changed his mind, Re could not stop the bloodthirsty goddess until she was tricked into drinking red beer instead of blood. Having become drunk, she turned into the peaceful cat, Bastet, and spared humanity. 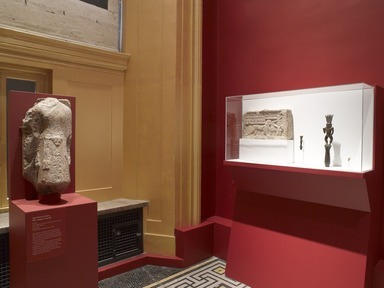 Male deities with leonine features, such as Bes and Tutu, were increasingly worshipped in the home in the later periods of Egyptian history. Their feline components linked them to the sun and signified protection. Often appearing together at home and in temples, Bes and Tutu were closely connected with healing and magic, and held influence over fertility, birth, health, and fortune. Although mostly responsible for earthly life, they also protected the dead in the Netherworld. A complex divinity, in charge of a person’s fate, the god Tutu was depicted as a striding sphinx with a snake tail. As the “Master of Demons,” Tutu controlled demonic entities, harnessing their power for protection, or preventing them from harming individuals. Represented in the form of a dwarf with a broad, leonine face as well as a lion’s mane, ears, and legs, the god Bes guarded people during dangerous times of transition. He was frequently consulted by women in the domestic setting, seeking his assistance during pregnancy, in giving birth, and through a child’s infancy. As a mythical protector of the child Horus, Bes was venerated in both private and official religion. 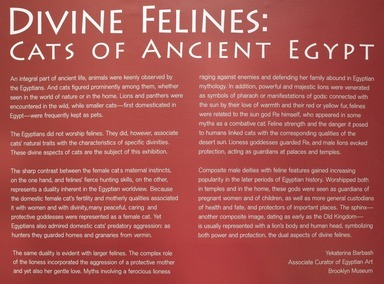 April 1, 2013 From domesticated cats to mythic symbols of divinities, felines played an important role in ancient Egypt imagery for thousands of years. 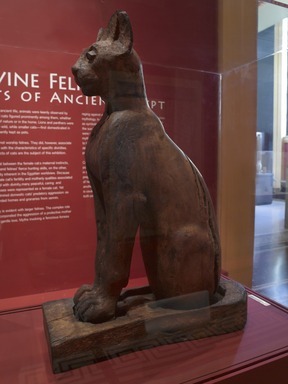 Now, nearly thirty diverse representations of felines from the world-famous Egyptian holdings of the Brooklyn Museum will be on view in Divine Felines: Cats of Ancient Egypt. 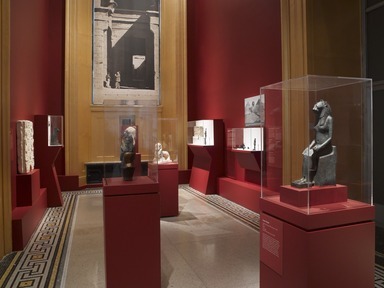 The exhibition, which explores the roles of cats, lions, and other feline creatures in Egyptian mythology, kingship, and everyday life, will be on view from July 24, 2013, through December 2014. Likely first domesticated in ancient Egypt, cats were revered for their fertility and valued for their ability to protect homes and granaries from vermin. But felines were also associated with royalty and closely linked with a number of deities. Combining a lion’s body and a king’s head, sphinxes guarded temple entrances and provided protection as temple objects. 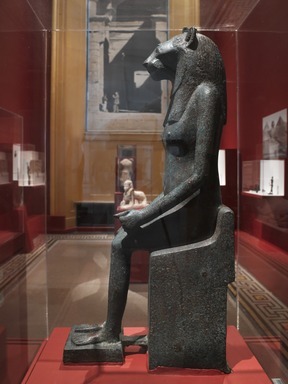 The ferocious goddess Sakhmet, depicted as a lioness or lion-headed woman, and the goddess Bastet, represented as a cat or a cat-headed woman, together symbolized the duality of feline nature—caring yet dangerous. The male leonine gods Bes and Tutu were popularly worshipped as protectors of fertility, health, and fortune. On public view for the first time will be an extraordinary gilded Leonine Goddess (770–412 B.C.E. 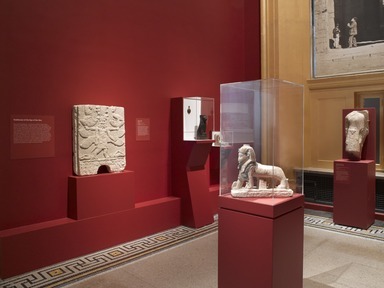 ), a lion-headed female crouching on a papyrus-shaped base, that entered the Brooklyn collection in 1937; the statuette was conserved for this installation. 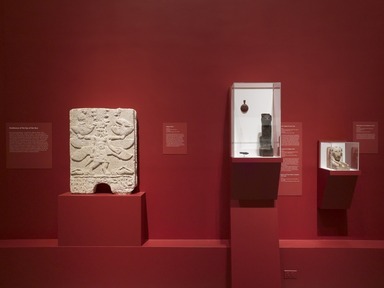 The exhibition’s cats and feline divinities range from a large limestone sculpture of a recumbent lion (305–30 B.C.E. 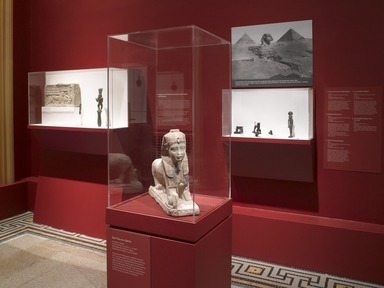 ), to a diminutive bronze sphinx of King Sheshenq (945–718 B.C.E. ), to a small cast-bronze figurine of a cat nursing four kittens (664–30 B.C.E.). Also presented are furniture and luxury items, decorated with feline features, in many media. 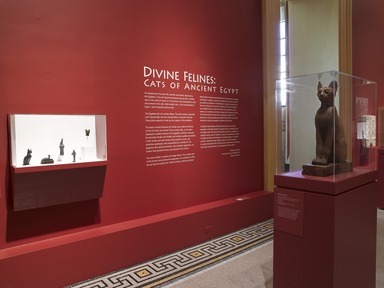 Divine Felines is organized by Yekaterina Barbash, Associate Curator of Egyptian Art at the Brooklyn Museum.